Turkey's government actively supports coal power expansion and subsidizes new coal-fired power plants, emphasizing increased mining of the country's widespread lignite coalfields as a way of minimizing imports of hard coal and natural gas. Thus Turkey's energy strategy is inconsistent with its climate change strategy. Coal power meets a third of Turkey's increasing electricity demand, and together with burning coal for heat makes up a quarter of Turkey's primary energy consumption. Turkey has only 500 million tonnes proven reserves of anthracite. Mining of this 'hard coal' is only done in the Zonguldak basin in the western Black Sea region and is underground and labor-intensive due to the very complex geology. In contrast most lignite mining is opencast and 15 billion tonnes of lignite are spread around Turkey, and the Energy Ministry is prospecting for more. Turkey is the seventh largest coal producer in the world, almost all lignite. The insignificant hard coal mining is heavily subsidized: in the public sector five hard coal deep mines are operated by Turkiye Taskomuru Kurumu Genel Mudurlu (TTK). Lignite is mined by state ownedTurkiye Komur lsletmesi Kurumu (TKI) in Afsin-Elbistan in southeast Anatolia and by the public sector electricity generator EÜAŞ, but most lignite is mined by private companies. And most coal mining employment is in the private sector: in 2017, according to the General Directorate of Mining, in over 400 workplaces. In 2017 over 80 million tons were mined, 90 million tons are predicted for 2018 and the target for 2019 is 100 million tons; with an ultimate goal of 150-200 million tons, almost all lignite. Amongst the proposed lignite mines in Turkey those in Thrace, Eskişehir and Afyon would be underground; whereas those in Konya and Karamanmaraş would be opencast. Tenders for several coal mines are being held during 2018. From 2000 to 2014 almost 100 miners died in accidents every year on average, and most mining accidents occur in coal mines. Per GWh of electricity generated Turkey's mines are the most dangerous in the world and unlike other countries fatality rates are not decreasing In 2017 inspections were stepped up but there were still deaths in illegal mines. Worker death statistics are no longer published by the government and ILO safety standards will not be implemented until 2020. Despite the dangers of PM2.5 there is no legal limit on its emission. About 2800 people die prematurely every year because of coal, most from lung and heart diseases. In 2018 at least 500kg of coal is being given to each poor family. The Chamber of Environmental Engineers is calling for natural gas, instead of poor quality coal, to be provided as support to poor locals. 4300 hospital admissions annually are estimated to be due to air pollution from coal. Although there is no legal requirement for a health impact assessment during power plant licensing, campaigners may try to use a 2017 case regarding nuclear power as a precedent for coal plants. Climate change is not on the political agenda but most Turks prefer renewable energy to coal. Although the public mainly prioritizes the cost of energy concern about its environmental impact is rising. According to article 56 of the constitution: "Everyone has the right to live in a healthy and balanced environment. It is the duty of the State and citizens to improve the natural environment, to protect the environmental health and to prevent environmental pollution." The government's policies on renewables and domestic coal aim to reduce its considerable expenditure on energy imports. Coal supplies over one quarter of Turkey's primary energy including about one third of its electricity. While the government continues to flag its desire to have a massive expansion in coal, some MPs and analysts are unpersuaded. Opposition MPs debating in 2016 complained that Turkish coal plants would receive large public subsidies and exemptions from environmental regulations. There are also risks that the government will lock itself into expensive power purchase agreements from privately owned plants: for example power from Çayırhan-B will cost 60USD per MWh for 15 years. In 2018 TETAŞ (the state-owned wholesale company which takes up previously stranded costs) will pay over 200 lira per MWh. The national energy and mining policy (Milli Enerji ve Maden Politikası), announced in April 2017 by Energy and Natural Resources Minister Berat Albayrak, promotes clean coal with the coal industry. In late 2017 the minister said that "By expanding the purchase guarantee, feed-in-tariff, we will start using the long-term incentive and support mechanism for local coal". The ministry, under the slogan and hashtag #BizimKömürümüzBizimEnerjimiz (our coal our energy), aims by 2023 (the 100th anniversary of the republic) to have increased the coal-fired installed electricity generation capacity from the current level of 17 GW to 30 GW;  including 25GW lignite-fired. In July 2017 opposition MPs requested a parliamentary enquiry into the health and environmental effects of the large number of coal-fired power stations planned and under construction. Turkey's policy negatively affects its reputation in the world and may affect future negotiations of the United Nations Framework Convention on Climate Change and at the G20. Renewable energy employs more people than coal. In 2017, according to the General Directorate of Mining, about 38,000 people were employed in coal mining, mostly by private companies. In total about one thousand people are employed per million tons annual production of domestic coal (80 millon tons were produced in 2017), according to the ministry; whereas 94,000 people worked in renewable energy in 2017. During installation of a solar power plant, a workforce of 33 people per megawatt is required, and 10 workers per megawatt are needed during the production phase; so solar power could create 180,000 jobs by 2023. Although central government attempted to assist Zonguldak around the turn of the century, unlike in neighboring Greece there is no current organized high level political or economic support to help regions transition away from dependence on coal. Limiting global warming would benefit the economy and the balance of trade, by limiting water stress and its effect on agriculture and food production. Coal is subsidized via: transfer payments from the Treasury, investment incentives for coal extraction, and electricity generation from coal-fired power plants, R&D support, subsidies for mineral exploration, improvement financing for coal mines and coal-fired power plants, investment guarantees, price and electricity purchase guarantees, coal aid to the poor, and other direct and indirect supports, totaling 260-300 million dollars a year. These amount to about 0.01 USD per kWh (0.02 USD if coal support to poor families is included). TETAŞ is the Turkish government owned wholesale company which takes up the stranded costs of domestic coal plants. In 2018 the base budget for the capacity mechanism alone (coal and gas) was 1.4 billion lira, however the 2018 formula stipulates increases depending on inflation and the USD exchange rate so the final capacity mechanism total may be around 2 billion lira. Because wind or solar power is not always available when needed, some countries or regions with a high proportion of it use a capacity mechanism (also known as a capacity market) which should remunerate other electricity generators and other capacity providers, such as demand response operators, for being available in case of need. For example in Britain, with its many wind turbines, wind and solar might be providing half the required power at midday in spring but very little during a dull, still winter week. The British capacity mechanism auctions meet the need for flexibility by paying some gas plants, but also nuclear, interconnectors, demand side response and distributed generation. Turkey is not yet close to the solar power percentage of Spain, which includes hydropower in its capacity payments. In contrast the Turkish capacity mechanism is not an auction but payments are determined by an EMRA formula. It is operated by TEIAS and does not fund any of Turkey's many flexible hydro plants or any interconnectors or demand response; although its currently stated aim is to establish sufficient installed capacity, including reserve capacity, for the supply of electricity security in the electricity market. Instead Turkey has been compared to Poland and its capacity mechanism is accused of being a subsidy of fossil fuels. In 2018 most large coal (including newer imported coal and also newer gas plants despite the 2016 law prioritizing local resources), but no other plants are eligible for payments via the capacity mechanism, and the need for it has been questioned. In addition to current healthcare costs extra are expected in future due to climate change. And if Turkey's pollution regulations were improved to the EU Industrial Emissions Directive then removal of SO2 alone could cost between 75 and 100 million euros for each coal plant. In 2017 $1.56 billion was spent on 320MW capacity imported coal power plants that also commenced generating power that year. As of 2017 Turkey intends to spend $14 billion for coal mining development and coal-fired power plants by 2023 (the centennial of the Turkish Republic). A local energy analyst writes in 2018 that international financial institutions will not invest: however BBVA, a Spanish bank, may continue to do so, and as of 2018 Chinese investment and loans for new coal plants continue. According to a 2017 analysis from İş Bankası the 30 year USD based government purchase guarantee encourages domestic banks to loan to projects which would burn local coal. Turkish banks have financed 9GW of coal power plant capacity: for example Garanti Bank has made many loans to coal projects over the years and, as of 2018, continues to offer finance. Newer coal-fired power stations in Turkey risk becoming stranded assets because according to the United Nations Environment Programme "Closing the emissions gap requires that these plants run with lower capacity rates, and are phased out before the end of their lifetime, and/or retrofitted with CCS facilities." Energy Minister Albayrak said in August 2017 that filtering systems would be completed based on the latest environmental criterion in all of Turkey's existing old plants by 2019 and that all power plants to be built from August 2017 on will be in line with EU standards. However currently Law 27605 regulates pollution (except CO2) from power plants, but not down to the limits of the EU Industrial Emissions Directive, and those EU limits will be reduced in 2021. Formerly all applications for a pre-licence for over 300MW (and some smaller) had to first obtain an EIA decision however now state owned and privatized generation plants do not have to comply with environmental legislation until end 2019. Academics have suggested an Environmental Impact Assessment (EIA) for operational plants. EMRA has 20 business days to evaluate an application for a preliminary license, often referred to as a pre-license. Pre-licenses can be extended up to 3 years. Opponents claim that the “urgent expropriation law” has been used excessively by the current government to secure land to fast-track energy and development projects. Data from continuous monitoring of flue stack emissions is not published on the internet. Turkey's lignite coal produces a high proportion of ash, and opponents claim that toxic elements in the ash have polluted air and soil and could leak into groundwater. Over 70% of the water consumed for electricity generation in 2016 was used by coal-fired power plants, mostly due to the use of wet cooling towers. Some plants, such as Soma Kolin and Çan-2, are being constructed in high water stressed areas. Konya Karapınar power station has been proposed for an extremely water stressed area. If carbon capture and storage (CCS) was used in future this would require much more freshwater. See also Turkey and climate change. Because the lignite burnt in Turkey's coal-fired power stations produces more CO2 per kWh electricity generated than most other types of coal, and almost all hard coal is imported and thus incurs emissions from shipping; for every kWh generated in Turkey by coal over 1kg of CO2 is emitted. Coal's share of Turkey's total greenhouse gas emissions of about 500 million tons is about a third. Averaging 6 tons per person per year in total (and predicted to overtake the EU average soon) thus about 2 tons per person per year is from coal, amounting to 154 million tons in 2016. Turkey's climate is already changing and the impact will be felt across the country. Overall, Turkey emits 1% of the world's greenhouse gas, 1/3 from coal. Plants over 20MW are required to report their CO2 emissions to the government but not to the public. In June 2018 the government was reported to be considering increasing the amount of sulfur allowed in imported thermal coal from 1%-2% to 3%. Low grade lignite pollutes city air: every year about 10 million tons of coal is burnt to heat older buildings, even in urban areas, where natural gas is available. 5.4m tonnes of coking coal and 0.7m tonnes of anthracite were imported in 2015 to use in steel production. As well as using coal for heat to make steel some companies; such as Kardemir, İsken and Çolakoğlu; have coal-fired power stations at their steelworks. 4m tonnes of petcoke and 3m tonnes of coal were imported in 2015 to use in cement production and the cement sector emitted 32 million tons of CO2. There are also many small coal-fired power stations at sugar factories. Only a quarter of Turkey's primary energy needs are met from domestic resources and the country is heavily dependent on imports of oil and gas. However hydropower is flexible and can supply over half of the 50GW peak electricity demand. Turkey generates about 300TWh per year. Lignite and hard-coal fired power stations between them account for 22% of the installed capacity of the electricity generation system. Approximately 30% of the coal used for power generation is imported, from countries such as Russia. The electricity market is an oligopoly with TETAŞ and EÜAŞ producing about 40% of Turkey's electricity, and the government sets the end-user electricity price. The Turkish government is attempting to privatise some of the few remaining state owned coal-fired power stations. For more details, see Alternatives to coal in Turkey. Currently about one third of Turkey's electricity is generated from coal, one third from natural gas, a quarter from hydro, and small amounts from solar, wind, geothermal and biogas; however hydropower can vary considerably from year to year depending on the weather. Mainly by taking advantage of Turkey's enormous solar energy potential and using more wind power, Turkey's energy needs could be met without using coal. This would increase employment and be cheaper in the long-term. On average electricity is transmitted from the east of the country to the west. Sometimes power plants in Anatolia are curtailed and compensated due to transmission limitations on the European side of Istanbul.. Lack of grid connectivity in suitable areas is hampering expansion of wind power. In 2017 over $1.5 billion was invested in plant to burn imported coal, adding 1,320 megawatts of installed capacity. Power from coal doubled over the ten years to 2018 and now the 40 coal-fired plants generate a third of Turkey's electricity, 92TWh in 2016. Coal-fired power stations in Turkey which burn hard coal are generally near the coast as almost all hard coal is imported, whereas those burning lignite are near coal fields. Yatağan power station: Constructed in 1976, this 630 MW power plant lacked a functioning waste-gas filtering system for 30 years. According to one press report, thousands of local residents filed complaints, and the trials linked to the plant became "one of the staple cases at the European Court of Human Rights." The plant has long been considered a blight on the scenic Aegean coast and local people continue to protest that it has damaged their health and olive groves. Kemerköy power station: Muğla’s Gökova plant is blamed for ending efforts to develop the area as a nature-tourism destination. 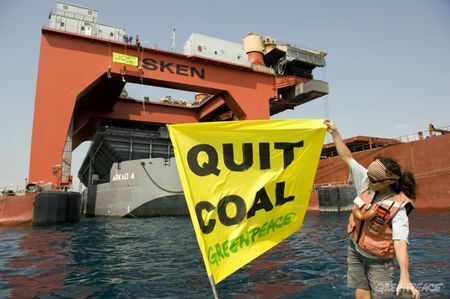 Sugozu power station: In September 2008, four climbers from Greenpeace's Rainbow Warrior were arrested after they occupied a giant coal loading platform to prevent a delivery of coal to this coal plant, which emits 10 million tonnes of carbon dioxide annually. Coal-fired power stations which have been financed by international public investment institutions include the Afsin-Elbistan power complex. "Let our lovely Gerze stay lovely. We don't want a thermal power plant to come to our Gerze..."
Turkey is planning and constructing new coal plants to be fired by local lignite mines in Thrace, Eskişehir, Afyonkarahisar, Kahramanmaraş, Bartin and other provinces. 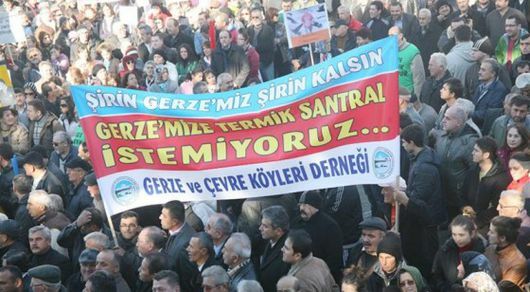 However Gerze power station was cancelled after strong local opposition and opposition to coal in Turkey remains determined. Anadolu Enerji and Hattat Holding Energy Group are two of the companies involved, and more companies are due to be selected during 2018. ↑ 1.0 1.1 "Fossil Fuel Support - TUR", OECD, accessed June 2018. ↑ 2.0 2.1 2.2 Turkey to make full use of domestic coal to minimize imports, Daily Sabah, Nov 6, 2017. ↑ Yerli kömürde atılım dönemi, Sabah, Mar 26, 2018. ↑ ‘Turkey has surrendered to energy lobbies,’ says CHP leader Kılıçdaroğlu, Hürriyet Daily News, Mar 25, 2018. ↑ Turkey's mining safety: a bleak track record, BBC, May 15, 2014. ↑ Turkey long a graveyard for miners, Hürriyet Daily News, May 14, 2014. ↑ Energy Ministry boosts inspections in mines, Hürriyet Daily News, Nov 18, 2017. ↑ Death and coal of the poor come from the same source, Hürriyet Daily News, Oct 20, 2017. ↑ 18.0 18.1 18.2 18.3 18.4 Toolkit: Coal Power Generation and Health in Three Regions of Turkey; Çanakkale, İzmir and Tekirdağ, Health and environment alliance - Heal, January 2018. ↑ 500 kilo kömür yardımı verilecek, Sabah, Jan 9, 2018. ↑ Environmental chamber warns of rising air pollution levels across Turkey, Hürriyet Daily News, Jan 5, 2018. ↑ "Turkish consumers believe high costs top problem in energy sector: Opinion poll", Hürriyet Daily News, Mar 21, 2018. ↑ "Half of Turkey's energy generated from local resources", Daily Sabah, April 19, 2018. ↑ Arthur Neslen, "Turkish coal plants in line for public subsidies", Guardian, Sept 6, 2016. ↑ "Kolin-Kalyon-Celikler win Cayirhan privatization tender", Anadolu Ajans, Feb 6, 2017. ↑ "TETAŞ'ın kömür santrallerinden alacağı elektrik fiyatı belirlendi", Memleket, Dec 2, 2017. ↑ "Coal-fired power plants: Europe shuts them down but we keep building them", Hürriyet Daily News, Feb 1, 2018. ↑ Solar power to create 180,000 jobs in Turkey by 2023, Daily Sabah, Aug 31, 2017. ↑ 58.0 58.1 "Turkey’s Compliance with the Industrial Emissions Directive," tepav, 2015. ↑ "Turkey invested $6.2B in power generation in 2017," Daily Sabah, 8 Mar. 2018. ↑ 74.0 74.1 Gökçe Şencan, "The AKP’s dirty relationship with coal," Independent Turkey, April 10, 2017. ↑ "Balkess D. J. EL-KHOZONDAR,INVESTIGATING THE USE OF WATER FOR ELECTRICITY GENERATION AT TURKISH POWER PLANTS page 84," Hacettepe University, 2017. ↑ "[https://www.greenpeace.org/archive-international/Global/international/publications/climate/2016/The-Great-Water-Grab.pdf The Great Water Grab: How the Coal Industry is Deepening the Global Water Crisis]," Greenpeace, March 2016. ↑ Seragazı emisyonları 475,1 Mt CO2 eşdeğerine yükseldi," Turkish Statistical Institute, April 27, 2017. ↑ "Temperature to increase significantly in Turkey in 30 years due to global warming, warns climate expert," Hürriyet Daily News, 19 March 2018. ↑ "State of the Voluntary Carbon Markets 2017," Forest Trends’ Ecosystem Marketplace, May 2017. ↑ "Roadmap for the consideration of establishment and operation of a Greenhouse Gas Emissions Trading System in Turkey," Ecofys, 2016. ↑ Gökşin Bavbek,"Adopting a Carbon Tax in Turkey: Main Considerations," EDAM Energy and Climate Change Climate Action Paper Series 2016/3, Oct 2016. ↑ "Kilickaplan, Anil & Bogdanov, Dmitrii & Peker, Bülent & Caldera, Upeksha & Aghahosseini, Arman & Breyer, Christian. ", "An energy transition pathway for Turkey to achieve 100% renewable energy powered electricity, desalination and non-energetic industrial gas demand sectors by 2050," Researchgate, 2017. ↑ About Turkish Mining, Mining Turkey, accessed April 2018. Acar, Sevil (March 2015). Subsidies to Coal and Renewable Energy in Turkey. The International Institute for Sustainable Development. ŞAHIN, Ümit (April 2016). TURKEY’S COAL POLICIES RELATED TO CLIMATE CHANGE, ECONOMY AND HEALTH. Istanbul Policy Center. ŞAHIN, Ümit (February 2018). Carbon Lock-In in Turkey: A Comparative Perspective of Low-Carbon Transition with Germany and Poland. Istanbul Policy Center. Contractual Arrangements in Turkey’s Coal Mines. International Labour Organization. Economic Policy Research Foundation of Turkey (TEPAV) (2016). Republic of Turkey Intended Nationally Determined Contribution. United Nations Framework Convention on Climate Change. United Nations (2015). Jensen, Génon K. (May 2014). THE UNPAID HEALTH BILL: HOW COAL POWER PLANTS IN TURKEY MAKE US SICK. Health and Environment Alliance (HEAL). Jensen, Génon K. (July 2017). Hidden Price Tags: How ending fossil fuel subsidies would benefit our health. Health and Environment Alliance (HEAL). Teske, Sven (May 2015). energy (R)evolution A SUSTAINABLE TURKEY ENERGY OUTLOOK. Greenpeace International. Schernikau, Lars (2016). Economics of the International Coal Trade: Why Coal Continues to Power the World (2nd ed.). New York: Springer. ISBN 978-3-319-46555-5. Sivaram, Varun (2018). Taming the Sun: Innovation to Harness Solar Energy and Power the Planet. Cambridge, MA: MIT Press. ISBN 978-0-262-03768-6. Kings of Coal: online campaigners’ toolkit on coal financing in southeast Europe and Turkey, Bankwatch, accessed January 2018. Coal and Climate Change - 2017, Önder Algedik, August 2017. Subsidies to Coal and Renewable Energy in Turkey, iisd, March 2015. Coal projects in Turkey, Black Atlas, accessed January 2018.
International Energy Agency, "2015 coal stats", International Energy Agency website, accessed January 2018. This page was last edited on 20 June 2018, at 15:28.